Goddess is a story about faith and corruption and political activism and doing the right thing. The story takes place in a present (?) day England that is badly crippled by riots and poverty and our main character, Aura, is pretty distant and sheltered from all of this growing up as she has in a cult that honours Artemis, a goddess from Greek mythology. At the start of the story Aura is just about to turn 16, the age where she transitions between being a handmaiden into that of a priestess in this cult. As a priestess, she is expected to give vows of obedience and chastity but before this happens, Aura meets this boy, Aiden, who makes her question everything that has grown up to believe. Other events occur that make Aura realise that the people she has trusted have been keeping secrets and are using the position that this cult holds as a means of power for their own gain. Aura ends up in trouble and needing the guidance and support of Aiden if she is to end up doing the right thing. I did enjoy Aura and Aiden's burgeoning friendship and the strength that Aura shows in standing up to the people who have raised her and for making the right choices when she comes to realise how other people are living outside of the luxury of this cult. And I felt that everything to do with the marches and protesting against political corruption and fairness for everyday people should resonate well with readers. I just didn't quite get if this book was aiming for a dystopian setting or an alternate history sort of thing? I felt like more world-building needed to be done for me to feel comfortable with the setting of this book. There was mention of a lot of familiar things and people and buildings and then also this massive cult of Artemis and I wanted to know more about how they fit into the every day world. Overall, I really enjoyed reading Goddess and will look into reading the other books Laura Powell has written! I flew through the pages of Goddess really quickly and I was surprised by the twists in the story towards the end and really felt for Aura's circumstances. I wanted the best for her. 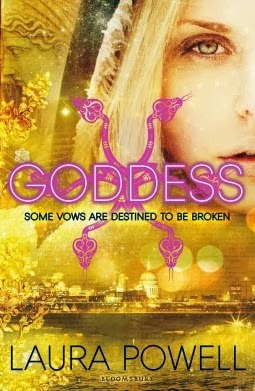 Goddess by Laura Powell is being published by Bloomsbury on the 8th of May.